Today Jil Sander launched it restyled website and online store to offer an entirely new shopping and communication experience. 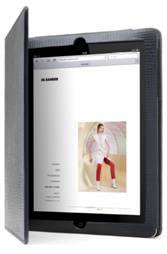 JILSANDER.COM reflects the pure and elegant style of the brand and echoes the sophisticated atmosphere of the Jil Sander boutiques. The aim of the website and the e-commerce redesign is to move the luxurious lifestyle world of Jil Sander also into the digital world. It will also enable the brand to open up a platform for an interactive discourse, creating closer relations with both longstanding clients and those who have just recently experienced the Jil Sander world. In time for the new season, the Spring/Summer collections for women and men ready to wear, shoes, bags, accessories as well as eyewear and fragrances will be available online.